The name Michael Jordan immediately conjures images of an unstoppable player with a knack for hitting huge shots and a problem of letting go of the game he loved. It would be hard to imagine the iconic player as a love-struck teen, wooing a female acquaintance but that appears to be the case. The website, Letters of Note, recently released the images and text from a letter apparently sent from Jordan to girl named Laquette. Although the year is not certain, if this was from his senior year in early 1981, it would have been right before his 18th birthday, which is mentioned in the letter. His signature at the end of the letter is also notable because it is a very nice and clean signature that is not commonly seen on his memorabilia. In the faded letter written on loose leaf paper, Jordan mentions that he is writing to her from his advanced chemistry class. Clearly, his lack of interest in that class did not derail his future basketball success but it paints an unlikely picture of the man who would be known as "Air Jordan." The full letter can be read here. On December 14th, 2004, Lelands Auctions sold the letter in question for just over $6,000 including fees. Although that was over six years ago, the story is just now making waves. When the news broke, Laquette Robinson, the same Laquette from the letter, was confused as she still believed the letter was in her possession. She alleges that a family member must have taken the letter to sell for their own benefit. Robinson is reportedly embarrassed with the publishing of the private letter and did not want Jordan to think she was the one who orchestrated the sale. Although nothing official has happened yet, she is expected to pursue legal action. Another letter purported to have been written to Laquette by Jordan while at the University of North Carolina has already appeared on eBay. The two-page letter, dated from May, 1981, differs from the earlier one as it has much darker ink and the more-traditional Jordan signature at the end. 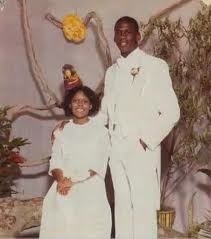 Also, the letter includes a photo of the two from prom, both decked out in all white. The Buy It Now price is listed at $9,750. View the listing here.